Increasing attention is being paid by public funders and private investors to the route towards scale-up of emerging technologies and deployment into a manufacturing environment. 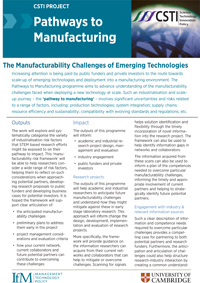 The Pathways to Manufacturing programme aims to advance understanding of the manufacturability challenges faced when deploying a new technology at scale. Such an industrialisation and scale-up journey – the ‘pathway to manufacturing’ – involves significant uncertainties and risks related to a range of factors, including: production technologies; system integration; supply chains; resource efficiency and sustainability; compatibility with evolving standards and regulations; etc.